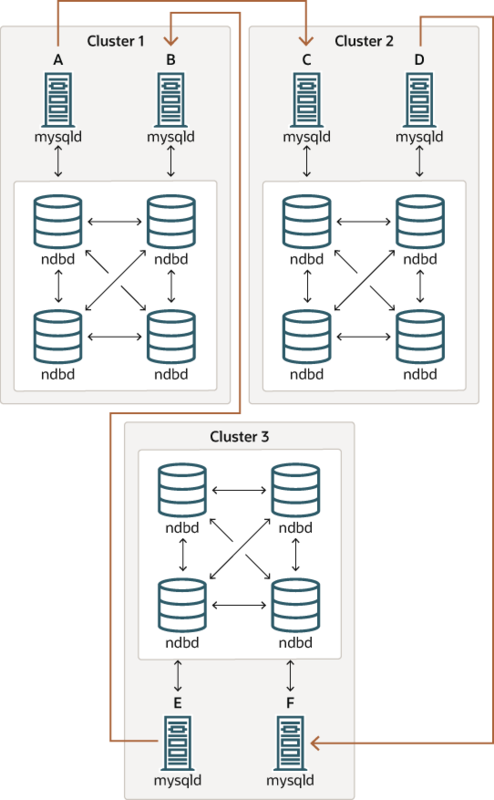 It is possible to use NDB Cluster in multi-master replication, including circular replication between a number of NDB Clusters. Circular replication example. In the next few paragraphs we consider the example of a replication setup involving three NDB Clusters numbered 1, 2, and 3, in which Cluster 1 acts as the replication master for Cluster 2, Cluster 2 acts as the master for Cluster 3, and Cluster 3 acts as the master for Cluster 1. Each cluster has two SQL nodes, with SQL nodes A and B belonging to Cluster 1, SQL nodes C and D belonging to Cluster 2, and SQL nodes E and F belonging to Cluster 3. In this scenario, SQL node A in Cluster 1 replicates to SQL node C in Cluster 2; SQL node C replicates to SQL node E in Cluster 3; SQL node E replicates to SQL node A. In other words, the replication line (indicated by the curved arrows in the diagram) directly connects all SQL nodes used as replication masters and slaves. In this case, different SQL nodes in each cluster are used as replication masters and slaves. However, you must not start any of the SQL nodes using --log-slave-updates. This type of circular replication scheme for NDB Cluster, in which the line of replication (again indicated by the curved arrows in the diagram) is discontinuous, should be possible, but it should be noted that it has not yet been thoroughly tested and must therefore still be considered experimental. Using NDB-native backup and restore to initialize a slave NDB Cluster. When setting up circular replication, it is possible to initialize the slave cluster by using the management client BACKUP command on one NDB Cluster to create a backup and then applying this backup on another NDB Cluster using ndb_restore. However, this does not automatically create binary logs on the second NDB Cluster 's SQL node acting as the replication slave. In order to cause the binary logs to be created, you must issue a SHOW TABLES statement on that SQL node; this should be done prior to running START SLAVE. This is a known issue which we intend to address in a future release. In other words, data replicates from Cluster 1 to Cluster 3 through 2 different routes: directly, and by way of Cluster 2. MySQL servers acting as replication slaves must be run with the --log-slave-updates option. Which mysqld processes require this option is also shown in the preceding diagram. Using the --log-slave-updates option has no effect on servers not being run as replication slaves. The need for failover arises when one of the replicating clusters goes down. In this example, we consider the case where Cluster 1 is lost to service, and so Cluster 3 loses 2 sources of updates from Cluster 1. 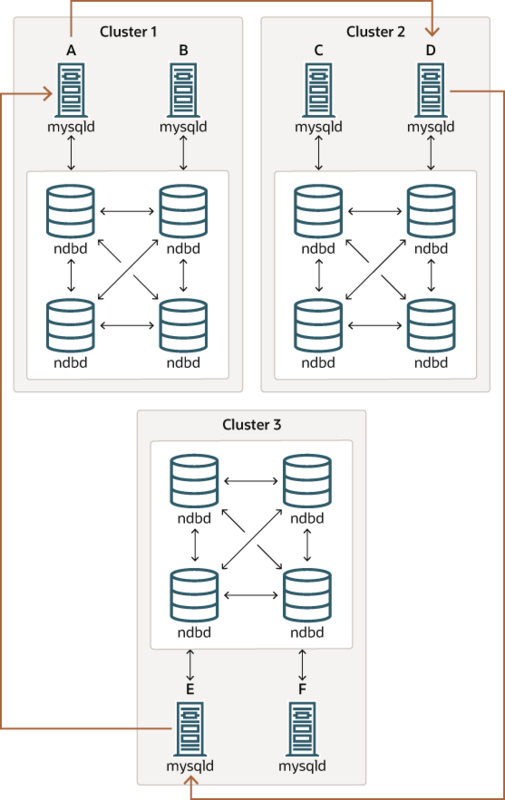 Because replication between NDB Clusters is asynchronous, there is no guarantee that Cluster 3's updates originating directly from Cluster 1 are more recent than those received through Cluster 2. You can handle this by ensuring that Cluster 3 catches up to Cluster 2 with regard to updates from Cluster 1. In terms of MySQL servers, this means that you need to replicate any outstanding updates from MySQL server C to server F.
You can improve the performance of this query, and thus likely speed up failover times significantly, by adding the appropriate index to the ndb_binlog_index table. See Section 22.6.4, “NDB Cluster Replication Schema and Tables”, for more information. Once this has been done, you can issue a START SLAVE statement on MySQL server F, and any missing updates originating from server B will be replicated to server F.
The CHANGE MASTER TO statement also supports an IGNORE_SERVER_IDS option which takes a comma-separated list of server IDs and causes events originating from the corresponding servers to be ignored. For more information, see Section 13.4.2.1, “CHANGE MASTER TO Syntax”, and Section 13.7.6.34, “SHOW SLAVE STATUS Syntax”. For information about how this option intereacts with the ndb_log_apply_status variable, see Section 22.6.8, “Implementing Failover with NDB Cluster Replication”.